Clootie dumpling is a traditional Scottish fruity suet pudding - an ancestor of the British Chistmas pud. It gets its name from the 'cloot' or cloth that it's cooked in. Bring a large pan of water to the boil. Mix the dry ingredients together in a large bowl. In another bowl, mix the sultanas and raisins, then peel the apple and grate it into the fruit. Mix the fruit into the dry ingredients, and add the eggs, milk and treacle. Stir well. Moisten your cooking cloth ('cloot') and sprinkle with a thin, even layer of flour. Tip out the pudding mix onto this, and tie the four corners of the cloth together. Leave enough string at both ends to enable you to loop it round the pan handles. Suspend the pudding in the water, turn down to a simmer, place a lid on the pan, and simmer for 4 hours, checking the water level occasionally and topping up if necessary. Towards the end of cooking time, preheat your oven to 160°C (320°F) if it's a fan oven, 180°C (356°F) if not. Line a baking sheet with foil and generously grease it with butter. When the dumpling has cooked, remove it from the water and let it sit for a while until cool enough to handle. Unwrap the dumpling and place on the baking sheet. Pop it in the oven for about 20 minutes to dry out and brown the crust. Turn it round halfway through drying to get even browning. The video above is from the Keef Cooks YouTube channel. 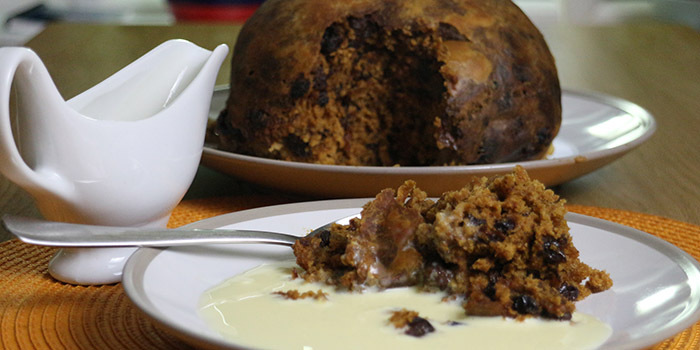 Click here to see the video recipe of Clootie Dumpling on YouTube. Lots of water, muslin cloth (or a clean tea towel or pillow case), string. Cooking time: 4 hours 20 minutes.